I love hearty vegetable soups in the winter. They are quick to prepare and non-judgmental when it comes to emptying the vegetable drawer in the refrigerator for a healthy dinner. One of my favorite stocks is Italian inspired and tomato based, sometimes with a splash of wine, and often with a rind of cheese added into the mix to exude delicious umami flavor while the soup simmers. I’ll then finish with beans or grains and handfuls of winter greens which wilt in the simmering stock just long enough to soften without discoloring. For this soup, I tweaked my favorite method and took a detour further south to Greece for inspiration. A splash of Ouzo (a Greek anise liqueur) amplifies the fennel in the soup and adds an extra layer of flavor that rounds out the tomatoes’ natural acidity. Rather than submerging a rind of cheese in the stock, I sprinkled feta over the soup for garnish. I must say I was pleased with this little detour, and I hope you are too. 1. Heat the oil in a large soup pot over medium heat. Add the onion and fennel and cook, stirring, until the vegetables soften, and the onion is translucent without coloring, about 5 minutes. Add the garlic, oregano, thyme, and red pepper flakes and stir until fragrant, about 30 seconds. Stir in the tomato paste to blend and then add the wine. Simmer until the wine is reduced by about one-third, about 2 minutes. 2. Add the tomatoes, chicken stock, 2 tablespoons Ouzo, the bay leaf, sugar, salt, and pepper. Bring to a boil, and then reduce the heat to medium-low. Partially cover and simmer 20 minutes, stirring occasionally. Taste for seasoning, and add a little more salt or another tablespoon of Ouzo if desired. 3. While the stew is simmering, remove the tough stems from the kale, stack the leaves, and slice crosswise into thin ribbons. Stir the kale and white beans into the stew and cook until the kale wilts, stirring frequently, 3 to 4 minutes. If the stew is too thick, top off with additional chicken stock and adjust the seasoning as necessary. Ladle the soup into serving bowls and serve garnished with crumbled feta and the reserved fennel fronds. When it’s too hot to cook, try serving a big summery salad for your main meal. Not just a simple garden salad, but a satisfying bowl layered with crisp veggies, grains or legumes, and fresh herbs. The combination is fresh, filling, and light – guaranteed to hit the spot on a warm day. This salad bowl includes the classic summer veggie trio of sweet corn, tomato, and avocado – tumbled together with protein-rich quinoa and mounded over a bed of kale. No need to cook the corn – summer corn is juicy and naturally sweet, and it’s crispness adds great texture to the quinoa. As always, you can tweak the ingredients to your taste. Feel free to substitute another grain for the quinoa, such as wild rice or bulgur. As for the kale, a quick rub of the hardy leaves with oil and salt helps to soften them and coax out their flavor. Alternatively, choose another more tender green, such as arugula or spinach, and skip the rubbing step. 1. Whisk the lime juice, vinegar, garlic, mustard, honey, salt, black pepper, and Tabasco in a small bowl. Add the oil in a steady stream, whisking constantly to emulsify. 2. Place the kale in a large bowl. Drizzle 1 to 2 teaspoons oil over the leaves and season with a generous pinch of salt. Rub the leaves until thoroughly coated (this will help to soften them). 3. Combine the scallions, corn, peppers, tomatoes, quinoa, parsley, and cilantro in a separate bowl. Pour about 1/4 cup of the dressing over the salad and gently stir to combine. Mound the salad over the kale. (Or divide between individual serving bowls.) Top with the avocado and drizzle with additional dressing to taste. You won’t regret buying out of season tomatoes with this fresh and easy pasta recipe. Hint: a little roasting will do the trick. If you’re like me and can’t resist buying hothouse grape tomatoes in the middle of the winter – even when we know better – this recipe will address any buyer’s remorse. It’s not the fault of the tomatoes, of course. They do look irresistible, but looks can be deceiving with these plump and oh-so-red tomatoes, which often disappoint in the flavor department when they are out of season. Not to worry – this recipe allows for a little off-season tomato indulgence with no regrets. Thanks to slow roasting, they will deflate from their impossible pertness to a more relaxed version of themselves, and any hibernating juices and natural sugars will be released. Along with a little simple seasoning to give them some oomph, and you will have a sunny and versatile condiment to beat the winter blues. Add roasted tomatoes to sauces and salads, use as a topping on pizza and crostini, or toss with pasta. In this recipe, I take advantage of the sludgy sheen of olive oil and tomato juice left behind in the pan after roasting. To sop up the flavorful oil, I sprinkle a layer of breadcrumbs over the pan to absorb the juices and toast the crumbs in the oven until golden. They are a delicious extra touch and garnish to this light and fresh pasta dish. 1. Heat the oven to 400°F. Scatter the tomatoes and garlic cloves on a rimmed baking sheet. Add the oil, 1/2 teaspoon salt, and 1/4 teaspoon black pepper and stir to coat. Scatter the thyme sprigs over the tomatoes and transfer to the oven. Roast until the tomatoes are softened and begin to release their juices, about 25 minutes, stirring once or twice. Remove from the oven and discard the thyme sprigs. When cool enough to handle, peel the skin away from the garlic and finely chop the cloves. Transfer the tomatoes and garlic to a large serving bowl. 2. Reduce the oven heat to 350°F. Sprinkle the breadcrumbs on the same baking sheet and stir to coat in the residual olive oil. Return the baking pan to the oven and cook until the breadcrumbs are golden brown, 2 to 3 minutes (they will brown quickly so watch them carefully). Remove and immediately transfer the breadcrumbs to a small bowl to stop them from cooking. Cool for 5 minutes and then stir in the 2 tablespoons cheese. 3. Bring a large pot of generously salted water to a rolling boil. Add the pasta and cook until al dente. Scoop out 1/2 cup cooking water and then drain the pasta. It’s peak summer season, which means it’s peak tomato season. The farmer’s market tables are piled high with tomatoes galore, and if you have a garden, chances are your tomato plants are weighed down with ripe cherries, robust Beefsteaks, and sassy Early Girls ready for the picking. The best way to enjoy a fresh picked tomato, in my opinion, is as simply as possible, so its natural sweetness and sun-kissed flavor shine through. In our kitchen, a favorite preparation is the Italian Caprese salad, a platter of thick slices of vine-ripened tomatoes layered with fresh mozzarella, and just-plucked basil leaves. All that’s needed is a drizzle of good olive oil and balsamic vinegar and the ingredients speak for themselves. Another equally popular preparation is tomato bruschetta – thick slices of grilled garlicky bread topped with a jumble of juicy chopped tomatoes, basil, and, ahem, more garlic. This is finger licking hands-on fare, best served family-style accompanied by a pile of napkins to wipe up the sweet dribbling juices. This past weekend, I combined these two recipes into one for a simple yet elegant presentation, including burrata cheese, grilled bread, and fresh basil, layered into small glasses. It was a smart and fun way to portion the tomatoes and dress things up for entertaining, while saving our summer whites from wayward juices. I am a sucker for heirloom tomatoes with their variety of colors, patterns, and bulbous shapes, and these glasses perfectly displayed them like confetti. A dollop of creamy burrata and a drizzle of aged balsamic vinegar resulted in a fresh and savory parfait that is as beautiful to look at as delicious to eat. Choose firm yet ripe tomatoes with a range of colors, and be sure to use a good extra-virgin olive oil and aged balsamic vinegar. You will need six (8-ounce) glasses for this recipe. 1. Make the crostini: Preheat the oven broiler or prepare the grill for direct cooking over medium heat. Whisk the oil, garlic, and a pinch of salt in a small bowl. Lightly brush each bread slice with the oil. Broil or grill the bread until crisp and golden on both sides, 2 to 4 minutes. Remove and set aside while you assemble the verrines. 2. Combine the tomatoes, oil, salt, and pepper in a bowl and gently stir to combine. Taste for seasoning and add more salt if desired. Divide the tomatoes between six (8-ounce) glasses. 3. Cut the burrata into 6 wedges and place one wedge in each glass. Drizzle about 1 teaspoon balsamic vinegar in each glass, and garnish with the basil and black pepper. Top each glass with a crostini and serve immediately. Are you looking for an easy and healthy weeknight meal? 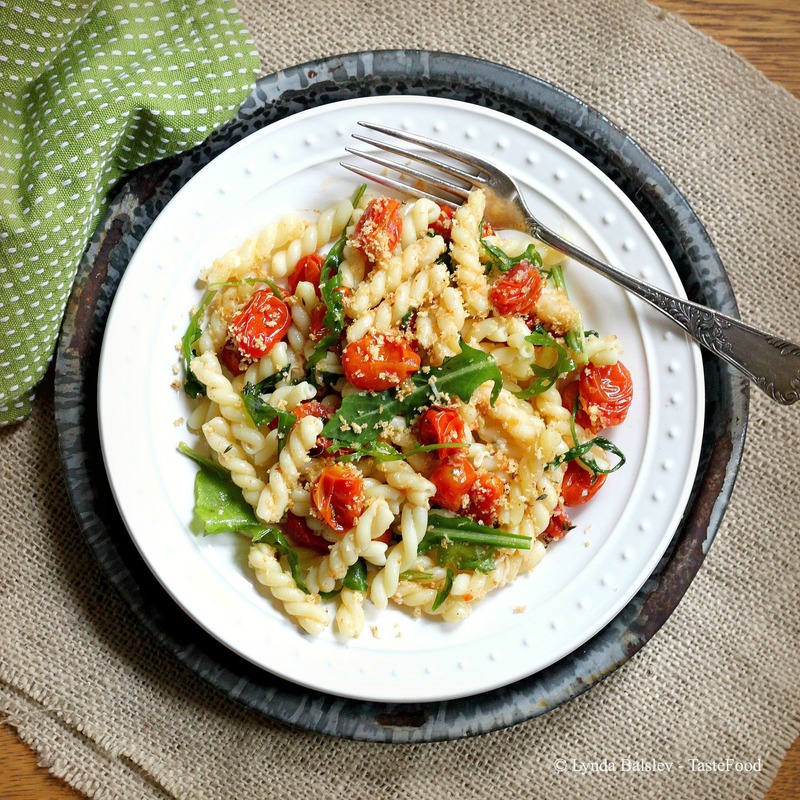 Here is a light and fresh pasta dinner that is guaranteed to please everyone. I make this recipe when I have gads of cherry tomatoes on hand. Slow roasting coaxes out their natural juices and sugars and intensifies the tomato flavor. Fresh arugula is tossed into the mix, slightly wilting from the heat of the cooked pasta. The final touch is a shower of toasted olive oil breadcrumbs, which adds comfort and a rich crunchy texture to the dish. Heat the oven to 400°F. Scatter the tomatoes and garlic cloves on a rimmed baking sheet. Drizzle with the oil and season with salt and pepper. Stir to coat. Scatter the thyme sprigs over the tomatoes and transfer to the oven. Roast until the tomatoes are softened and begin to release their juices, about 25 minutes. Remove the tomatoes and discard the thyme sprigs. Peel the skin away from the garlic and finely chop the cloves. Transfer the tomatoes, garlic, and any pan juices to a large serving bowl. Reduce the oven heat to 350°F. Sprinkle the breadcrumbs on the same baking sheet. Add the oil and stir to coat. Return the baking sheet to the oven and toast the breadcrumbs until golden brown, 2 to 3 minutes. (They will brown quickly so watch them carefully.) Remove and immediately transfer the breadcrumbs to a small bowl to prevent further cooking. Cool 5 minutes, then stir in the cheese. Bring a large pot of salted water to a rolling boil. Add the pasta and cook until al dente; drain. Add the pasta to the tomatoes. Add the arugula, cheese, and oil. Toss to combine and slightly wilt the arugula. Add half of the breadcrumbs and stir once or twice to blend. Divide the pasta between serving plates. Garnish with the remaining breadcrumbs and freshly ground black pepper. Serve immediately. 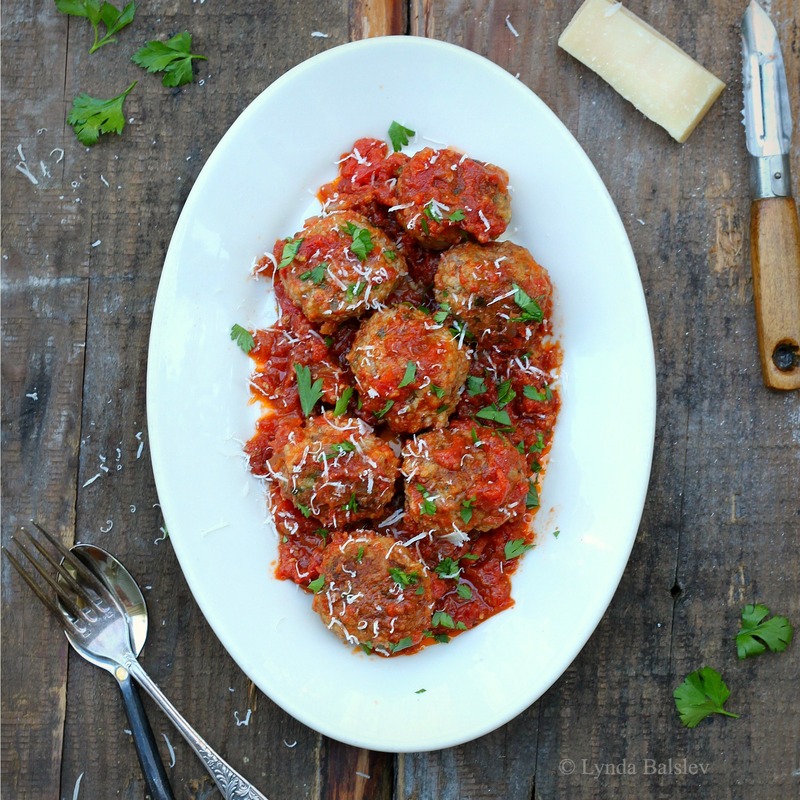 If you are like me and enjoy homemade tomato sauce year round, this recipe will do the trick. While summer tomatoes are ideal for any tomato sauce, you can still manage a decent sauce with your supermarket variety. Start by roasting the tomatoes to coax out and concentrate their flavor – and don’t hold back on the seasoning. In this recipe I roasted an armful of plum tomatoes and added a roasted red pepper for extra sweetness and bold color. If decent plum tomatoes are nowhere to be found (it is March, after all), you can make the sauce with the ubiquitous grape tomatoes readily found in most shops. The key is to taste, taste, taste. Add a spoonful of sugar for the extra sweetness you miss. Crushed red pepper flakes and black pepper add dimension to the sauce with a nice kick. And don’t be bashful when it comes to the salt. Keep on tasting, then let the sauce rest for a few moments to allow the flavors to meld. 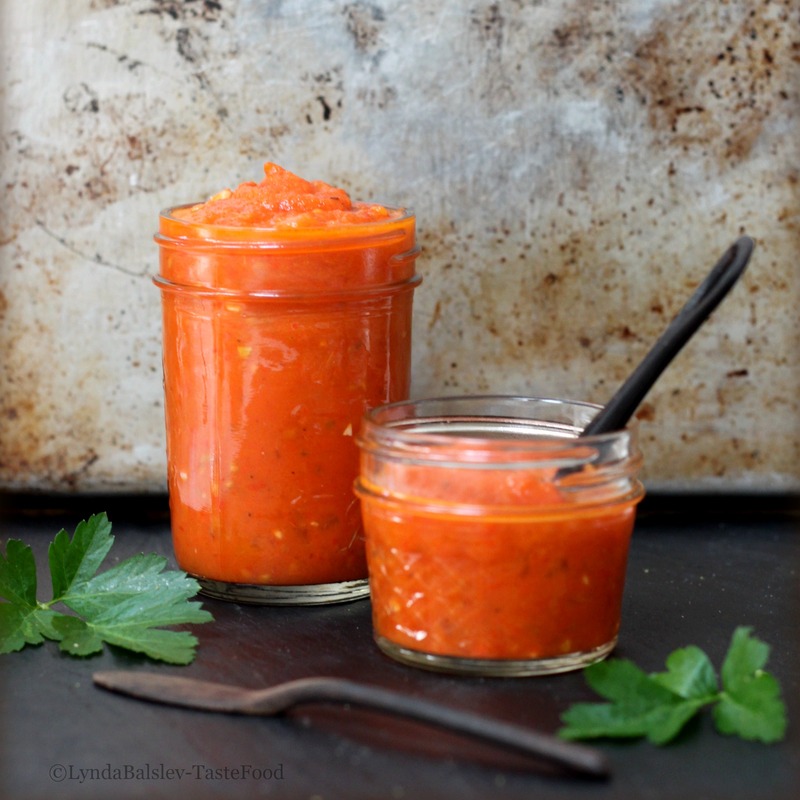 You will be pleased with the results: This no nonsense, faux summer sauce is a bright and fresh condiment to splash on pasta, smear on pizza, or layer into gratins any time of year. Grape tomatoes may be substituted for the plum tomatoes. Note that you will not be able to remove their skins, which will yield a more chunky sauce. Heat the oven to 400°F. Brush the tomatoes and peppers with oil and season with salt. Arrange in a rimmed baking pan, cut side down. Roast until softened, beginning to shrivel and slightly golden, about 45 minutes. Remove from the oven and cool to the touch, then remove the skins. Combine the red bell pepper and tomatoes in the bowl of a food processor and process until smooth. Heat 2 tablespoons oil in a medium saucepan. Add the onion and sauté until soft and translucent without coloring, 4 to 5 minutes. Add the garlic, oregano, and red pepper flakes and sauté until fragrant, about 1 minute. Add the roasted peppers and tomatoes, 1/2 teaspoon salt, and the black pepper and simmer for 10 minutes. Now that it’s behaving like fall outside, I find myself making a b-line to the meat stalls at the farmers market. Sure, I’ll be stuffing my bags with apples, mushrooms, kale, and persimmons later – but first I want some meat, because when it’s cold and rainy, I crave hearty warming dinners like meaty stews and slow-cooked braises. Last weekend I purchased a few kilos of ground beef and pork from a local ranch to throw in the freezer for (another) rainy day, but not before setting aside a few pounds to cook for dinner. It was only 8:00 in the morning and I already knew what I would be making that afternoon – comforting meatballs smothered in marinara sauce. Combine the meatball ingredients in a large bowl. Using your hands, gently mix until the ingredients are evenly distributed. Shape the meat into 1 1/2-inch balls, without over working the meat. (Wet your hands with cold water from time to time to prevent sticking.) Place the meatballs on a platter and cover with plastic wrap. Refrigerate for at least 1 hour. Heat the oil in a large saucepan over medium heat. Add the onion and sauté until softened, about 3 minutes. Add the garlic and red pepper flakes and sauté until fragrant, about 1 minute. Add the remaining ingredients and bring to a boil. Reduce the heat and simmer uncovered until thickened, about 30 minutes. Heat 1 tablespoon oil in a large skillet over medium-high heat. Add the meatballs in batches, without over crowding, and brown, turning as needed, about 5 minutes. (The meatballs will not be cooked through at this point. They will continue to cook in the sauce.) Transfer to a plate and repeat with the remaining meatballs. Add the sauce to the skillet and cook briefly over medium heat, stirring up any brown bits in the pan. Add the meatballs to the sauce and turn to coat. Cover and simmer over medium-low heat until the meatballs are thoroughly cooked through, about 30 minutes. Serve with garnished with chopped parsley and grated cheese. Tip: Got leftovers? Crumble any leftover meatballs into the sauce and serve over pasta or layer into lasagna.